Find A Grave Memorial# 62317301. "Simeon C. Green, a resident of Sharon for 40 years, died at his home, the old Whirling Gregg place, on Friday afternoon at 4:15 PM, having never recovered from a shock sustained a couple of days before. He had been in feeble health for some time. Mr. Green was well known as a farmer, a calling which he had followed all his life. "Simeon was born in Bow, N. H., Oct. 25, 1822, where he received his education and lived some years. Dec. 10, 1844, he was united in marriage to Sarah A. Hadley of Dunbarton, who survives, together with eight, out of eleven children. Find A Grave Memorial# 24062983. Find A Grave Memorial# 44542911. Find A Grave Memorial# 24062395. 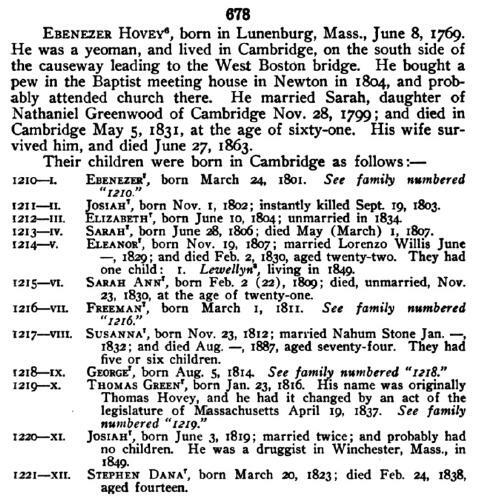 The Hovey Book: The English Ancestry and American Descendants of Daniel Hovey of Ipswich, Massachusetts, , at https://books.google.com/books?id=-VVVAAAAMAAJ . Haverhill, Mass. : Press of Lewis R. Hovey, (1914) , p. 261. Don Gleason Hill, Early Records of Dedham, Massachusetts, Vol. 2, , at https://books.google.com/books?id=ewIMAAAAYAAJ . Dedham, Mass. : Dedham Transcript Press, (1888) , p. 242. 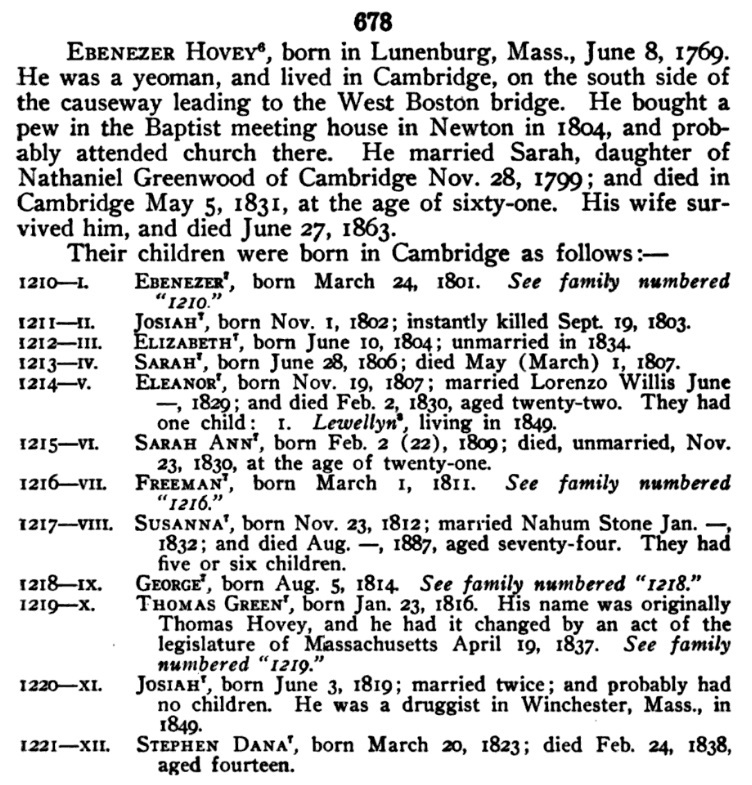 Biographical sketches of representative citizens of the commonwealth of Massachusetts, , at https://books.google.com/books?id=pvIMAQAAMAAJ . Boston: Graves & Steinbarger, (1901) , p. 437. "United States Census, 1860", database with images, FamilySearch (https://familysearch.org/ark:/61903/1:1:M7WV-KNS : 30 December 2015), William Griffin, 1860. The census of 1900 shows: Mary Augusta Griffin and William Griffin of Hampstead, N. H.
Harrison Colby, A genealogy of the descendants of Abraham Colby and Elizabeth Blaisdell, his wife, who settled in Bow in 1768, , at https://archive.org/details/genealogyofdesce00colb . Concord, N.H.: Printed by the Republican Press Association, (1895) Microfilm #896944 of the Family History Library, Salt Lake City, Utah, p. 58. "United States Census, 1900," database with images, FamilySearch (https://familysearch.org/ark:/61903/1:1:M3YN-W98 : 20 January 2015), Augusta Duston, Salem town, Rockingham, New Hampshire, United States; citing sheet 3B, family 60, NARA microfilm publication T623 (Washington, D.C.: National Archives and Records Administration, n.d.); FHL microfilm 1,240,950. "United States Census, 1900," database with images, FamilySearch (https://familysearch.org/ark:/61903/1:1:M3YN-W9D : accessed 19 December 2016), Augusta Duston, Salem town, Rockingham, New Hampshire, United States; citing enumeration district (ED) 215, sheet 3B, family 60, NARA microfilm publication T623 (Washington, D.C.: National Archives and Records Administration, 1972. ); FHL microfilm 1,240,950. "New Hampshire Marriage Records, 1637-1947," database with images, FamilySearch (https://familysearch.org/ark:/61903/1:1:FL6D-R4V : 12 December 2014), Sterling C. Griffin and Emma A. Abbott, 11 Sep 1899; citing Wakefield, , New Hampshire, Bureau of Vital Records and Health Statistics, Concord; FHL microfilm 1,000,995. 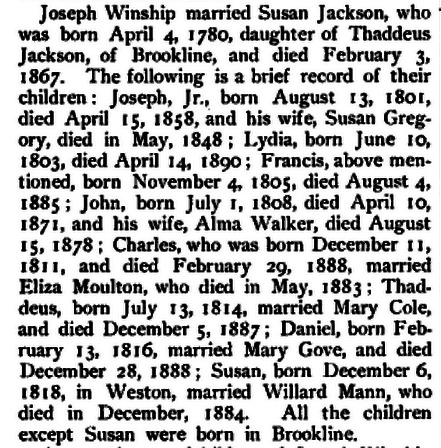 "New Hampshire Marriage Records, 1637-1947," database with images, FamilySearch (https://familysearch.org/ark:/61903/1:1:FL6F-HSL : 12 December 2014), William A. Griffin and Mary E. Stevens, 12 Nov 1863; citing Hampstead, Rockingham, New Hampshire, Bureau of Vital Records and Health Statistics, Concord; FHL microfilm 1,000,996.